longest cave in the world. Caver Mike Wiles has helped document the far reaches of this cave that's a favorite Black Hills tourist attraction, but tours are available here year-round and elsewhere for the more casual explorer. Wiles and other volunteers mapped Jewel Cave's passageways past 142 miles, making it the second-longest cave in the world. Nearby Wind Cave National Park is the eighth longest. Some people have made caving out to be an extreme adventure, but it's really safer than a lot of activities on the surface, he said. The challenge and thrill come from discovering corridors that have never been reached — sometimes after days underground. "I don't go for the rush. But instead of a rush I just have this long-term, continuous enjoyment with it. That way I don't get burned out," Wiles said. "It is really, really exciting to go into some big passage where no one's been before. Or to find something in the cave that's unique that you've never seen before." Wiles said he was reluctant on his first trip underground in 1976, but soon realized he excelled at it, despite never doing well at other sports. For his efforts, he was awarded the 2007 Lew Biking Award from the National Speleological Society — the top caver. They started becoming popular with vacationers in the 1800s and now draw millions of visitors a year, said Gary Berdeaux, who co-owns Diamond Caverns in Park City, Ky., with his wife, Susan. She's also the national coordinator of the National Caves Association, which represents commercial caves. "The reason these things survive is their universal appeal. There's something that goes back to primal man, since caveman days it's been a place of shelter, of worship. It's been a resource of minerals to carve," he said. "Today it's just a natural curiosity. 'There's a big, dark hole over there. Where does it go?' It's mysterious. That allure transcends race and gender and nationality. It's just a universal appeal." And it's true for both publicly and privately owned caves, Berdeaux said. Many private cave owners initially had a reputation of destroying the natural underground beauty, but that's not the case, he said. They have an incentive to protect caves the same way states and the federal government do for those attractions, Berdeaux said. "People oftentimes feel that unless it's a public-owned cave, state park or national park, that it might not be as beautiful or significant, but that's not true," he said. "We really have in many ways the love of the resource in our heart as our brethren in the national and state parks." Part of each cave must be altered to make way for rails and stairs and lights so people can be educated about its uniqueness, but most of a cave is left untouched, Berdeaux said. "By sacrificing a certain portion of the cave you can preserve the entire cave," he said. Most caves that offer tours close or go to reduced hours during the winter because of dwindling tourist numbers. But because underground temperatures are mostly constant, some places do stay open and draw people year-round. Before going on any a tour it's wise to check out the specifics of the cave for the level of challenge, safety concerns and other factors to consider, Berdeaux said. A jacket or sweater and good walking shoes are a must for most tours, some of which are even handicapped-accessible. 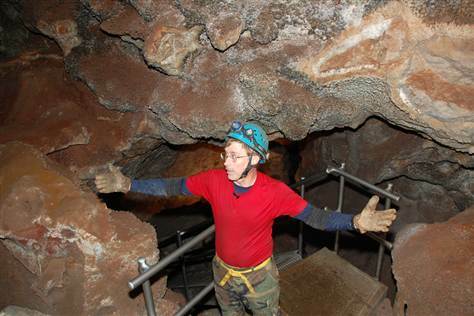 And for many caves, reservations are required because space is often limited, said Ken Zortman, lead park ranger at Jewel Cave, which celebrates 100 years as a federal park this year and offers three different tours. The scenic walking tour is suited for nearly everyone and entails about 700 stairs over a half-mile. "You get to see the most impressive thing, which is the calcite crystal that lines the inside of the cave," Zortman said. The lantern tour is a bit more physically demanding. It's led by rangers in 1930s-era clothing and runs through the historic part of the cave. "It's much more strenuous because you're in the upper parts of the cave. And you don't typically find wide open rooms. It's more confining, and of course you're walking on the cave floor," Zortman said. And it's possible to see bats, he added. For the more adventurous, there's the spelunking tour at Jewel. First, you have to be able to crawl through a concrete block that's 8 inches by 25 inches. The tour includes some large passageways but also a few tighter spots that are that size. "There's a few squeezes," Zortman said. Though some people have fears of going underground, generally most phobias disappear when they start taking in the natural beauty, he said. Then the fun becomes exploring other caves. "Once they learn about caves and enjoy what it presents I think it becomes, 'Well here's a cave. Let's check what's different in this one compared to the other one we visited,'" Zortman said. The National Caves Association has a complete list of all caves in the U.S. and tips on taking a tour on its Web site. For the more serious caver, the National Speleological Society is active in studying and preserving caves, educating the public about caving and sponsors an annual convention for its more than 11,000 members that have a variety of backgrounds, said Stephanie Searles, operations manager. "Anywhere from geologists to someone who's just interested in caving. We've got doctors, professors. Just all kinds of people who cave," she said, adding that more women have taken up the sport. The NSS has resources and a list of caving clubs on its Internet site.